These monster cookies have everything in them but the kitchen sink, and they are gluten free. Sometimes when baking it is really hard to find recipes that are good for gluten free adaptation. These cookies are a lot like the 3-Ingredient Peanut Butter Cookies, but these have more ingredients add. 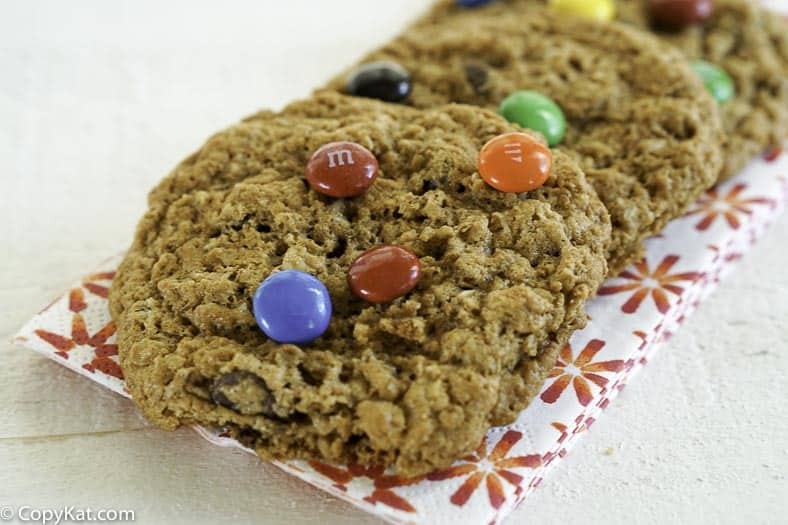 These cookies contain butter, peanut butter, sugar, oatmeal, chocolate chips, and if you like you can also add some M&Ms. These cookies bake up crispy, and these make a lot. I love to use a cookie scoop when I make cookies so I always have uniform cookies. The last time I made these cookies I got over 8 dozen out of this recipe. So you will have lots of cookies to enjoy, and plenty to share. Are you looking for more Gluten Free Cookies? Check these out. Thanks to DebraG for sharing her cookie recipe. 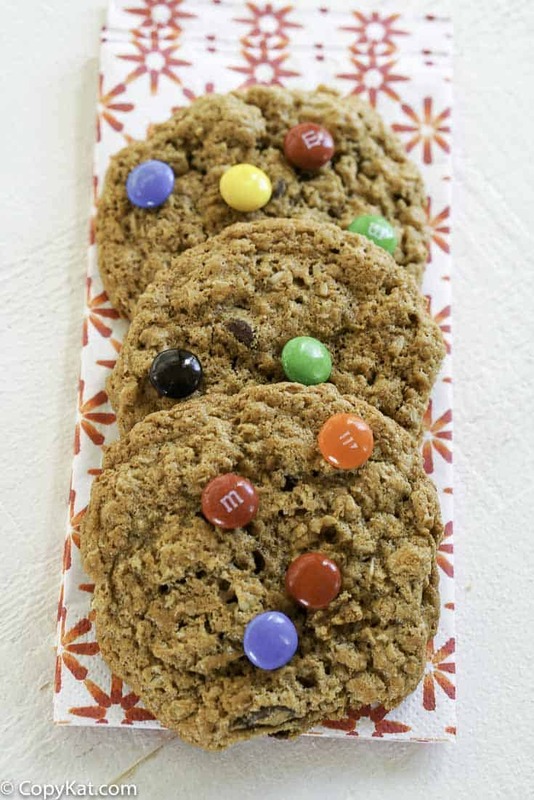 Make these gluten-free Monster cookies. Mix in order given using mixer. Transfer batter to large container and add the following: 6 more cups quick cooking oatmeal 2 cups Nestle chocolate chips ( I use chocolate and peanut butter chips) 1 medium bag M&M's - these can either be included in the batter or used on top (I mix them into the batter) Mix until well blended. You should chill the batter for about 1 hour before making the cookies. These cookies can spread out, and it is best to go ahead and chill these to keep them from spreading when the bake. I like to use a 1-ounce cookie scoop to keep the cookies perfectly uniform. Bake at 350 degrees for 10-12 minutes. Freezes well. Depending upon the size of your cookies, I typically use a cookie scoop, I believe it is 1 ounce, I would think this would easily do around 100 cookies. Wow, this sounds good. I love the idea of the m&m’s in this recipe.